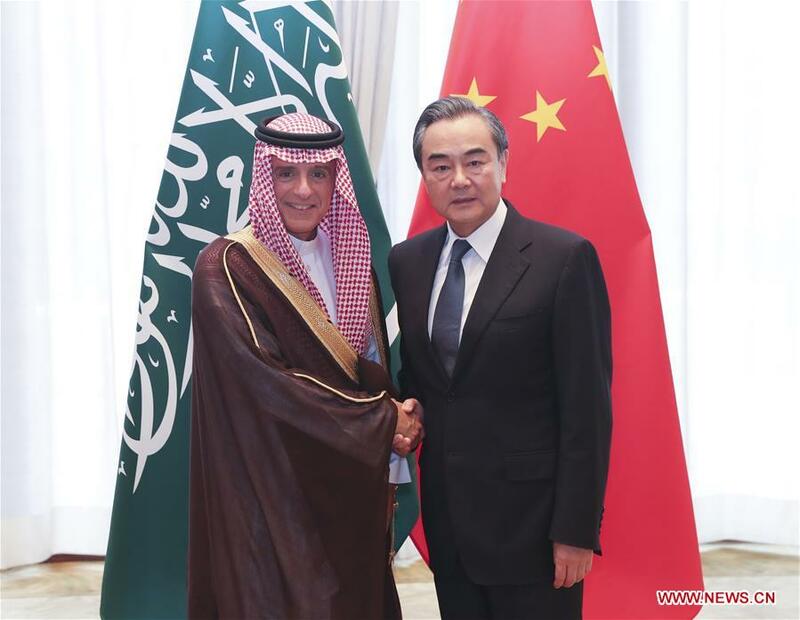 BEIJING, July 9 (Xinhua) -- Chinese State Councilor and Foreign Minister Wang Yi called for deeper synergy of the Belt and Road Initiative and the Saudi Vision 2030 plan on Monday in Beijing. China supports Saudi Arabia in pursuing a development path which suits the country's conditions and has its own characteristics, and supports Saudi Arabia in making and implementing the Saudi Vision 2030 plan, said Wang. Co-hosting with Saudi Foreign Minister Adel bin Ahmed al-Jubeir, Wang made the remarks at the third meeting of the political and diplomatic sub-committee which is under China-Saudi Arabia high-level joint committee designed to guide and coordinate bilateral cooperation. "China and Saudi Arabia should make full use of the high-level joint committee between the two countries and promote concrete cooperation in various fields," Wang added. Echoing Wang's remarks, Jubeir said the Saudi Vision 2030 was highly consistent with the Belt and Road Initiative. Connecting the initiative and the plan, China and Saudi Arabia can strengthen cooperation in industries including energy, mining, economy and trade, investment and tourism, and tripartite cooperation in Africa, said Jubeir. Saudi Arabia also welcomed China to play a bigger role in the Middle East and the Gulf region and is willing to work closely with China to prevent and combat extremism and enhance coordination and collaboration in global and regional affairs, Jubeir said. Jubeir is also visiting Beijing for the eighth ministerial meeting of China-Arab States Cooperation Forum.